Happy Wep Ronpet! Today is the first day of the Kemetic new year, a year of green and building under the guidance of Ptah, creator and patron of artisans and craftsmen, consort of Sekhmet. I like Ptah a lot and was leaning towards Him before the year’s oracle was announced, so it fits extra-well to me. I rather like having two new years – one in January, my personal new year, and now one almost perfectly opposite it, for Kemetics. More fresh starts and renewal energy. Is good. In the tradition of Wep Ronpet activities, one makes a representation of Ap-p (Apophis), the snake that embodies isfet, the monster that Ra in His solar barque must defeat each night so that the sun may rise at dawn– and then one slays that representation. 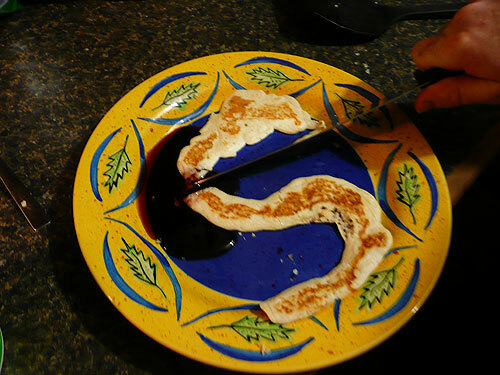 J made a pansnake (pancake-snake), and we slew it with great fanfare. It bled boysenberry syrup. I left the severed head, along with a blood-colored drink, on my altar. Since I could not do the ritual of the Red Pot, where one smashes a terracotta pot to symbolically destroy the thing(s) holding one back, I made do with fire magic instead. I’d acquired a copper bowl for exactly such a purpose, in Sekhmet’s name, a while back, and this was the first time in using it. (Anyone familiar with magic will probably already know what I did – write down the thing(s) I want destroyed, burn the paper, scatter/bury the ashes. Standard stuff.) I felt better afterwards. And then I went the hell to sleep because it was almost 2 am and I was exhausted.